I've decided to start a Friday book review. I love to read so I feel it makes sense to share books with you that I have loved, or at least liked. I'm not going to share books that I didn't care for because I'm not an actual book critic, and it would be a waste of my time. Plus there are very few books that I flat out don't like. I had a really hard time getting through Shania Twain's biography. I wanted to like it, but don't waste your time. Anyways, the first book I want to share is Memoirs of an Imaginary Friend by Matthew Dicks. When I started the book I had forgotten what the blurb on the inside of the book jacket had said the book was about. I thought it was a man's memoir about the imaginary friend he used to have. (I know, I know. The book jacket says "a novel", but in my defense I take off the jackets when I'm reading a book so I didn't see that.) The book is actually from the point of view of Budo, the imaginary friend of a boy named Max. Budo and Max have such a sweet relationship, and when Max goes missing it is up to Budo to find him and help him return home. I had a hard time putting this book down - the story flows so easily, and Matthew Dicks does a wonderful job of keeping you feeling like you need to know what is going to happen next. If you're needing an easy beach read, or simply want a book you can finish in a weekend, Memoirs of an Imaginary Friend is the book for you. These chocolate chip oatmeal pancakes have become my go-to breakfast to make on the weekends, and they're even great warmed up for a quick weekday breakfast. You use bananas rather than sugar, and the oats kick up both the fiber and the protein content over a traditional pancake. I tend to use dark chocolate chips rather than milk chocolate to keep the sugar down as well. Plus don't they say now that dark chocolate should be part of every well-balanced diet? :) Ok, maybe that goes too far, but once you try these pancakes you may never want a regular pancake again. 1. Mash banana and baking powder together with a fork. 2. Add egg, cinnamon, vanilla, oil, milk, and peanut butter. Mix well. 3. Add flour and oats. Stir together. 5. Spoon into nonstick pan and cook as you would regular pancakes. The recipe I adapted this from is a vegan recipe. I am not a vegan so I changed it to use items I have on hand and added a few things like the cinnamon. Feel free to make ingredient substitutions. For example, if you don't drink cow's milk, use almond milk or something else. You can use any sort of nut butter you'd like, I just happen to have peanut butter. I like these pancakes with no syrup. I just don't think they need it. Lars, however, puts both butter and syrup on his. I will put a bit of butter on them if they are reheated the next day though. Try them both ways and see which way you prefer. This recipe doubles (and triples!) easily so if you want to make a bunch of pancakes to last you through the week go ahead. Just wrap each serving in plastic wrap and refrigerate until you're ready to eat them. I've been looking into getting our couches reupholstered, and I'm loving the look of a neutral fabric. Right now we're pretty much stuck with the pillows and accessories we already have because the pattern of our couch fabric doesn't allow for much else. I would love to be able to go to a store and pick out new throw pillows or some coffee table accessories without having to think about coordinating with the couch. 1. Preheat oven to 350º. Mix ricotta, Parmesan, egg, spinach, basil, and salt and pepper. 2. Spray baking dish with cooking spray and spread 1/2 cup of marinara sauce on the bottom of the dish. 4. Roll up each noodle and place seam side down in baking dish. 5. Spread remaining marinara sauce over each lasagna roll. 6. Sprinkle shredded mozzarella on top of each roll. 7. Cover dish tightly with foil and bake 40 minutes or until mozzarella is melted. 8. Remove from oven, let cool a few minutes, and enjoy! Simply cook the noodles according to the package directions. Once they are cooked, I took mine out of the pot with tongs and laid them on paper towels. It is easiest if you then place the "dried" noodles on wax paper to spread the ricotta mixture on each. The wax paper will let you easily, and without tearing the noodle, roll each up before placing it in the baking dish. I used fresh spinach because the smallest frozen spinach I could find was 10 oz which is way to much for 6 lasagna rolls. If you're going to double the recipe feel free to buy a box of frozen spinach instead of chopping fresh. 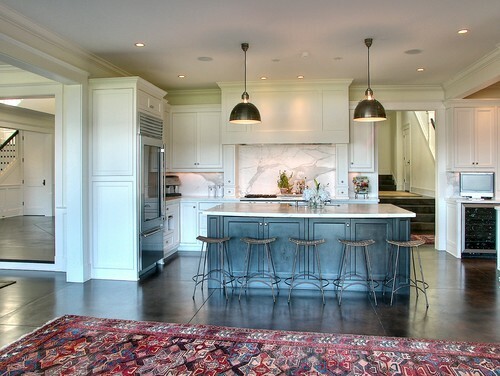 Have you ever been in a home with concrete floors? We have concrete flooring in all but our bedrooms and closets, and after some initial skepticism, we love it! It's super easy to clean and maintain, it's never icy cold in the winter, and yet it's a cool relief in our hot Austin summers. I saw this article about the benefits of concrete floors and had to share it since obviously I'm a huge fan of concrete flooring. If you're even remotely thinking about concrete floors in your home, go see a few houses or showrooms with concrete floors and see what you think. You may just find that you love them too! I've been feeling under the weather for most of March, but a visit to the doctor and some antibiotics seem to be helping so I'll be getting the blog back on track next week. I hope you all have a wonderful weekend! We typically go out every Friday, and I go to a Bible study on Monday nights so Lars is on his own those nights. I also decided to take out what I had planned for the last weekend in March because we're still finalizing our Easter plans for that weekend. For reference I marked where to find the recipes if I don't usually make them or if they aren't on my food board on Pinterest. I spent time on Friday making a list of everything that I would need for my month of meals save for milk, bananas, and any weekly produce that I might need. Based on the recipe menu above, I came up with the weekly grocery list you see below. Not bad huh? The remaining grocery trips should not only be super quick but also fairly inexpensive. Even now, only three days into the month, I'm already feeling this sense of calm about upcoming dinners. Am I the only one who gets semi-stressed about what to eat each night? I no longer have to think about it or ask Lars (to no avail) what he'd like for dinner. I just look at the calendar and eat either what's listed for that night or something listed for the week. One thing I did want to note is that I don't have any "leftover" nights scheduled. I've been getting pretty good at making only enough for us to eat for dinner, and any leftovers that we do have get eaten for lunch so we rarely make a nighttime meal from leftovers. If you're toying with the idea of monthly meal planning, I say give it a go. I'm seeing if it truly does decrease my dinner-induced stress for the entire month as well as if it has any positive effect on our grocery budget. Let me know if you have any tips or tricks that would make this experience even better, and good luck with your own meal planning!